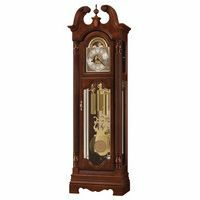 An extraordinarily detailed grandfather clock with bookmatched olive ash burl gracing the front and sides of the unique swan neck pediment, and a carved urn finial and finial support add the finishing touch. 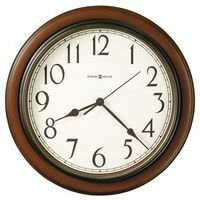 One of the most popular floor clocks in the Howard Miller Presidential Clock collection. 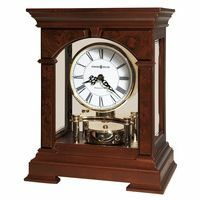 The elaborate dial includes raised brass Arabic numerals, cast center and corner ornaments, and a moon phase with exclusive Presidential Collection hemispheres. Attention to detail continues on the multi-tiered base, where you?ll find canted corners, olive ash burl, wrap-around carved moldings, and uniquely elegant carved feet.